It makes all the difference to go camping and cook food inside a cooking tent. Some people think it’s a daunting task, but it isn’t. All you need to do is make the necessary preparations, and you should be good to go. But what is a cooking tent set up and how do make one? We will answer that question for you in this post. 1. Why You Need a Cooking Tent? If you’re camping in fine weather, then you can settle for a small gas stove with no problems. Bring the equipment with you and feel free to use it when it is convenient to do so. But if like me, you are always camping with the family, then it would be best to have a cooking tent that will contain your cooking gear and shelter you from bad weather. 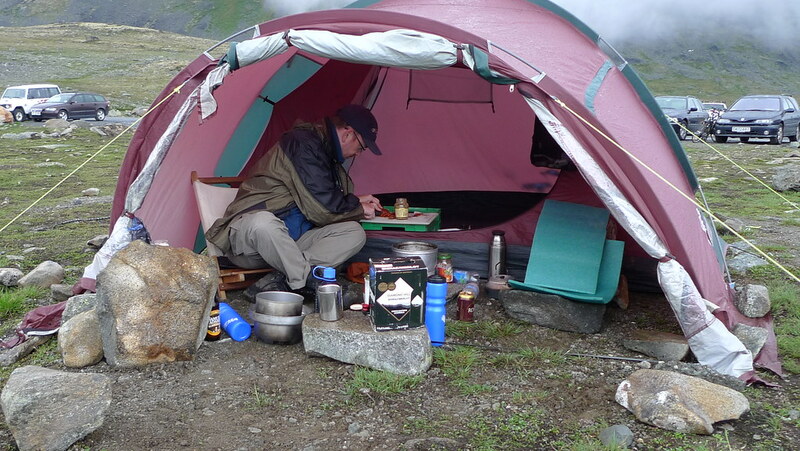 You may argue that your sleeping tent has enough space for your cooking needs, but it is still not advisable to do so. It’s too risky. Most tents may have fire retardant materials, but if fire can burn concrete, it can still burn the fabric. Tents provide enough ventilation only for sleeping, and there isn’t enough for cooking. Cooking inside the tent will increase condensation. Not only will it accumulate smoke inside your tent, but carbon monoxide will also accumulate, and that could be harmful to you and your family. The grease that results from your cooking may spoil the fabric of your tent and make it less water retardant. If you are using a gas stove, you are advised to keep them outside your tent. The best set up would be one where you have a cooking area inside another tent (one that you don’t use for sleeping). There are two ways to do this. First, you can buy a cooking tent, or you can set it up by yourself. This section will give you an idea of what a cooking tent set up looks like. There are various ways to go about it but let’s make it simple for now. Obviously, the first thing you need to set up is the shelter. The cooking tent, again, can be bought, or set up with a tarp. Using a tarp is one of the most practical and cheap ways to protect your cooking area from the elements. Setting up a tarp is also a good skill. You can’t always buy your way through things, and it sometimes pays off to learn how to do things yourself. Tarps can be set up in various ways, and it all depends upon the space and weather condition. Again, there’s a DIY way in doing this, and there’s also the tarp kit. You can find instructions on how to set up the shelter with tarp here. A windbreak is another crucial part of your shelter. This keeps the wind away while you are cooking and also conserve fuel. A windbreak will also block areas where people are not allowed to walk in. This will prevent people from accidentally bumping into your stove. Kitchen Table and Storage. There needs to be a place for you to store your food, both degradable and non-biodegradable. You should also have an area to store your cutlery, cups, plates, utensils, pans, and pots somewhere. You would also require a tough and leveled platform to put your gas stove on. It should be spacious enough for you to put hot plans and serve food. Aside from a table for the gas stove, you would also need a large garbage bag. I also make sure to include the camping cooler in the setup. This spares me the trouble of having to bring an electric hookup; they may not be allowed in your camping area. Coolers will make sure you have not only cold drink but also fresh food for cooking. To experience that great cooking experience while camping, make sure you have everything you need for the activity. The set up may require a bit of work, but in the end, you will be able to cook delicious food that your family would love to eat anytime during the day. We hope you enjoyed this post. If you have questions and comments, feel free to address them in the comments section below. I am a very passionate blogger and camper. My long experience as a camper has provided me with the knowledge and expertise on camping. 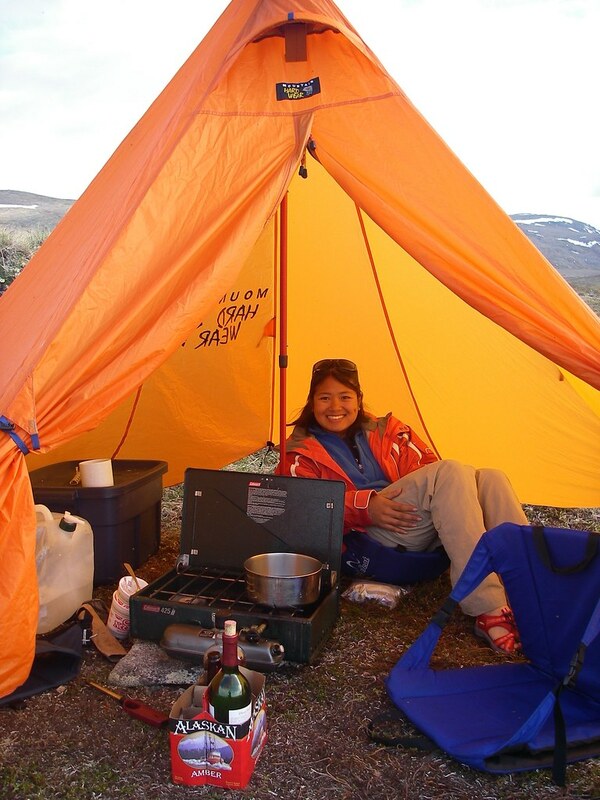 It is my goal to give advice on camping tips; gear tips, guidelines, reviews, lists, and more. At Rainyadventures﻿.co﻿m posts cover different topics from all the years I’ve spent camping in the wilderness. As a blogger, I continue to look for new ideas about camping and share them with you because I believe that camping is supposed to be fun and exciting. I hope you will enjoy my blog.